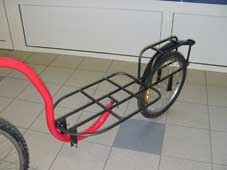 an adult bike and a child bike in tandem. With DRIV'JUNIOR you can safely bring your children aged 4-8 for a ride. You will not fear dangerous steps aside and long rides. You induct the main fixations on the two bikes (You don't need to remove them for individual use of the bike ). Next: three fast lockings and then you can ride. Use your adult bike and the 14-20 inches bike of your child. DRIV'JUNIOR is a patented system. Invented and developped in Espalion in the south of France.